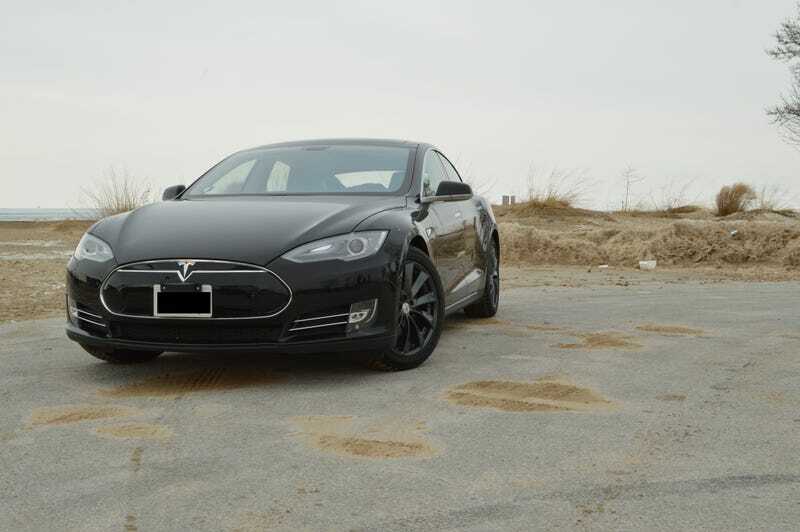 Why I wanted to hate the Tesla Model S, and why I can't. So after seeing all the hate and vitriol (yeah I know big word) on Cynical's post of the Model S doing a burnout, I knew I needed to finally put this article up asap. "Full disclosure. Tesla is not paying me. I could also care less about the stupid fires, all makes and models at sometime start on fire, and I absolutely love the sound of wailing engines. In fact, I hated the idea of an electric car and dismissed them completely for a long time. My ride in the Tesla, was given to me by my uncle, who doesn't own any stock or have a gun to my head or any of my loved ones." Disclosure over? Good, here is my little story on why I really wanted to hate this car, but couldn't. Have no doubts, the Model S will burn rubber like a mother. My uncle has a few really awesome cars, two Vipers, a NSX, and a new Model S. One day he took me, two of my cousins and my other uncle for a ride, so a total of about 1000lbs of dude in the car. What took place after blew my mind. However, before I get to this, I have to tell you why I wanted to hate this car. Now like many of you, I am a purveyor of speed, a grand master of gasoline, a parishioner to the Church of Noise. I think that electric cars are like the G Wiz, or golf carts, something to hoon about with on a golf course, not the street. I understood that these would probably be a passing fad until we figure out the whole Hydrogen thing. Electric cars were something to be mocked, and are even more harmful to the environment than their gasoline powered brethren. That last one really irks me and continues to irk me, especially when I see people driving the Prius with their holier than though attitude and look upon their faces. I guess they don't understand that they have to mine all of the battery internals in one country, ship it to another country to be refined, ship it to another country to be put together into the shape of a battery, and then ship it again to be put into the car! This isn't done through some crazy magic carpet ride that runs on rainbows and unicorn farts! It's done on big ships that burn diesel and churn out CO2! This is more harmful to the environment than that guy down the street's Hummer that gets 10mpg. By the time you get your little eco friendly hatchback, its already done a million miles in harm, and then you run it for another 150,000 miles. Then repeat the whole process because you will need a new battery after 150,000 miles! Ok enough of that rant, I think by now you can all understand why I hate the electric car, not only because they are slow and dull, but because of the under whelming knowledge that those car owners have on their cars. Nevertheless, to reiterate I am a gear head, I am a petrol swilling car nut that just wants to go fast. Now comes the truly crazy part. I arrived at my cousin's house for our annual New Year's brunch. My uncle arrives a bit later. Both my cousin and I are car guys and we've been talking shop for a long while when my uncle interjects, "Hey did you guys see the Tesla?" Both my cousin and I look at each other and shout "NO!" at the same time. "Can we see it?" we both ask. He threw us the key, or rather the weird little Tesla shaped key fob. You know when two people try to get out a small door at the same time and they keep getting stuck? Yeah that was us. We wanted to check out the crazy iPhone 38, I mean the Tesla Model S. We just thought of it as a new tech toy, a new phone, a new tablet, just like a big rolling computer. So after checking it out for a long while, playing with all the fancy gadgets, wondering how to tell if it's on? We finally asked if we could go for a ride. A few nanoseconds later there we are, my two cousins, my two uncles, and me in the passenger seat, which I might add is an awesome bucket seat. A total of about 1000lbs of people in the car. With the car already weighing a hefty, 4600lbs, I couldn't help but to think that this is a lot of weight to ask the car to do about anything besides just lumber along up to speed. WTF just happened, how the hell are we already in another state! Seriously, this car/roller coaster was stupid quick. I describe it as a roller coaster because you are launched from 0-60; there is no need to build momentum. You are here one second and somewhere very far away the next. The acceleration isn't like your typical gasoline powered car. The acceleration is very much like a roller coaster, very linear and direct. That is what you get when you can have access to all your torque at 0 RPM. You just touch the gas (Tesla prefers you call it the accelerator) and you are instantly transported to another place and time…the future. Being the car guy that I am, and after that little demonstration, I asked to see if we could time the zero to 60mph with us all in the car. My uncle obliged and we still hit it in under 5 seconds. UNDER 5 SECONDS IN A CAR THAT WEIGHS 5600LBS! That my friends, was the start of me beginning to understand why electricity isn't always a bad thing when associated with the powertrains of cars. We passed a group of small children, when my other uncle who was in the car said "give them a good show!" We zoomed past them in utter silence. I could not stop laughing. Is this the future? No engine noises to scare those around you? The face will scare children though. After our ride I spent some more time just poking around the car, asking stupid questions, and just in general drooling all over it. It looks absolutely hot when you are up close and personal, and in the Black on black wheels version that my uncle had, it was brilliant looking. I know a lot of people dig at it on the styling, but just stand next to one and you will become a believer. At this point I think my uncle wanted me to stop drooling on the paint and said "Wanna take it for a spin?" I could not say yes fast enough. I didn't have time to do a full on test, so that's why this isn't a review. However, I still want to impart a little bit of the ride with you all so that you can look at this car with more of an open mind. The overall experience was a bit disconcerting. There is no start up, so you never know if the car is on at all. Like never. My uncle informs me that it is technically always on, which again weird's me out. So, you pull the gear stalk and that puts you into reverse, again no noise whatsoever for you to go off of, also no mechanical noise to hear if you actually engaged reverse. The only time you know that you are in reverse is when the dash becomes a giant rear-view camera, which is totally cool. Then you push the stalk again, like your turning on your turn signals and you start forward. A small whine comes from the power plant, but almost no sound. There is also no wind noise because this car is buttoned up tighter than a drum. I take it along for a bit, not gunning it, again not my car and this one cost him $120k! The steering is a bit numb to be nice. There is no real weight to the steering, but oddly, I knew where the car was taking me. It is an odd setup, something I think could be fixed by weighting the steering a bit better. Nevertheless, I get used to that. After about fifteen minutes with the car, we start heading back. Now at this point only my uncle and my wife are in the car with me, so weight has come down dramatically. I ask if I can play a bit with the acceleration, and my uncle just says, "just don't get too crazy, we still have to make it home on this charge." Oh, I forgot that, instead of those stupid gas-wasting gauges, it has a power output gauge that tells you how much you're wasting and with the KERS system how much you're gaining back under decel which is kind of cool. When I get to a small straight with no one around I gun it! Holy Mother of God are the only words I can think of. The acceleration of this car is like riding a 1000cc sport bike. It just pins you back and has instant acceleration, it is one of the biggest laughs I have ever had. Stupid is the word that comes to mind. Stupidly awesome. This is not a car; it is actually the world's most comfortable roller coaster. It is stupid, brilliant, scary, awesome, weird as all get-up, and utterly mind blowing. My hatred towards this car was towards those individuals that buy these kinds of cars and know to a minor extent, how actually un-environmental they are. However, this is a car that every car guy should try out. We all are going to go kicking and screaming into the next few decades where oil and gas are going to become less plentiful, manufacturer's going more and more hybrid tech, and even going completely EV. But what this car does is show us that, us gear heads and speed freaks don't have to worry about smoking our tires, or doing a buck forty. It shows us that we do indeed have a future. It may not be how we want our future, without the sound of an engine and believe me I love the sound of an engine, I have a track pipe hooked up to my FR-S, but let me tell you we are going to exist in the future and get there really f-ing quickly. Follow me here on Twitter! Also check out my new series Sittin Waitin Wishin, the third installation will be up later this week! Also I made the Front Page of The Smoking Tire check out their stuff!